Ah, September! Growing up, September always meant two things for me: trudging back through another year of school to achieve mediocre grades and the start of the new TV season. It has become clichéd to explain that perhaps younger people may be surprised that network television followed a rigid schedule of September being the start of the TV season and the end was May. It has a special place in my heart to such an extent that I have shoe horned it into my little blog. Now, as I mentioned before, every program I watch for this blog is generally randomly picked. Though, it is a tradition for me that any program I pick in September, I automatically watch the first episode of the series. This year we kick it off with All Creatures Great and Small. This is nice as I took May to look at final episodes and last episode I looked at in May was the final episode of All Creatures Great and Small. Fall also seems to be the perfect time of the year to watch All Creatures Great and Small. It is best to watch particularly on a Sunday afternoon eating a roast by a fire. None of which I have actually ever done. Where we left the good people of Darrowby in May is a completely different place as where we start off with this episode. 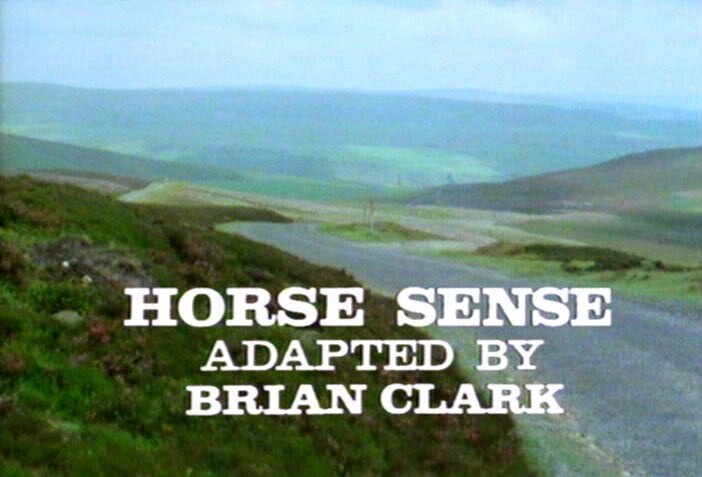 The first episode of All Creatures Great and Small is called Horse Sense and this is truly a first episode. Sometimes, new TV series start up with all the characters in one place such as Absolutely Fabulous. All the characters exist in their settings from the start and we, the viewer, are allowed into this world. This is a perfectly acceptable way to start a TV series. With Horse Sense, we start off on the bus with young vet James Herriot on his way to the small town of Darrowby. He has just graduated from veterinarian school and is qualified to work in practice. He has come out to Darrowby to interview with a practice in hopes to get a as an assistant. After getting off the bus, he makes his way over to Skeldale House where the practice is located. A certain Siegfried Farnon should be there to welcome him in but he’s not there. He away visiting his mother and the housekeeper, Mrs. Hall, doesn’t know when he will be back. James doesn’t have to wait long to get into the thick of it as some of the farmers come to pay Siegfried a visit to get him to come out to their farms. This includes Mr. Biggins who waffles over whether or not someone should come out to see his cow. Biggins is a character that will make appearances in episodes right up to the final one. Finally, Siegfried comes back from his visit to his mothers and takes James on the rounds with him. They stop at a farm with a horse that had puss in his hoof and another farm where a cow had a blocked teat. The cow wasn’t too happy with James and kicked him down. James who was undeterred got up and finished the job. There are a montage of scenes indicating that James & Siegfried has done a lot of visits. Included in this montage is the first time, of many, where we see someone put there arm way into a cows arse and pull stuff out. Hmmm…maybe forget the earlier suggestion of watching this while eating a roast. After that, James and Siegfried stopped at the local pub in Darrowby where Siegfried offered James the job. It is at the pub where it is obvious that farmers don’t hold vets in very high regards. To be more accurate, they are very skeptical of parting with their money for services. Biggins made a big deal of this earlier when he had visited Skeldale house. Basically, life had changed for James at the pub. He was one of the few graduates from veterinarian school to get a job which paid well and included room & board. The next day he started in earnest as he opened up surgery at the practice. This was an area that Siegfried wanted to improve in the practice as he felt the industry was leaning towards more small animal work. The only customer James got was a small girl who didn’t speak and she brought in a tortoise which looked like it was healthy. The episode ends with James needing to rush out to look at a horse that belongs to a Lord. The lord was not in attendance but a very bad tempered manager was there. Normally, horse work would be handled by Siegfried but he was once again away visiting his mother. What James found on the horse was that it was beyond help and was in excruciating pain. James needed to put down the horse. The Manager was extremely upset about this and threatened to sue. The follow episode Dog Days, shows as Siegfried does the post mortem on the horse that James was right. If I may steal a bit from my article in May, how All Creatures Great and Small got to TV is interesting. James Herriot was a country vet in Yorkshire. His actual name was James Alfred Wight. For years, Wight had a desire to write but as being a vet, the practice took up most of his time. Finally in 1966 at the age of 50, Wight was challenged by his wife to finally sit down and start writing, what he eventually came up with was the short book, If Only They Could Talk published in 1970 and followed up by It Shouldn’t Happen to a Vet in 1972. In that same year, these two sets of stories ended up being published together under the banner title, All Creatures Great and Small as US publishers thought the two other books were too short to publish on their own. When All Creatures Great & Small came out, it became a massive hit prompting a film in 1975 called All Creatures Great and Small and a sequel, It Shouldn’t Happen to A Vet the following year. This is an awesome opening episode to an incredible series. To me, the thing that was missing from the later A&E co-produced episodes is energy. From the opening music, which is more driving and almost jazz-like during the first 3 series, to the youthfulness of the actors, there is something really fun about these episodes. It almost feels like perhaps the actors mirror the characters they play. 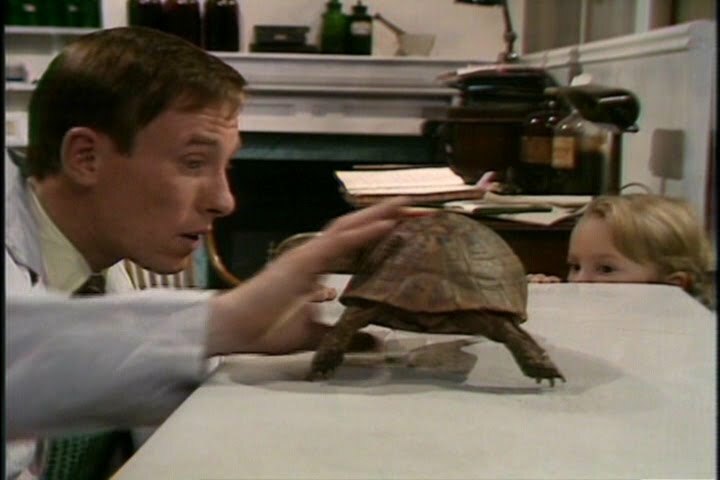 For example, Christopher Timothy is very early on in his career. This is the first series where he is the lead. It’s his first major job just like the James Herriot he plays. By the time we get to the end of the series, he is definitely in a routine. Life seems very routine for James. In fact he is not very interesting at all and maybe that is why the focus for the final episode was more towards Tristan or the two brothers who were fighting. In Horse Sense, James is youthful. A whole new world is there for him. This episode has some nice touches. There are a couple of moments in the episode where James stops and basks in his moments of personal success. He is proud of himself to take the journey to Darrowby, he is proud of himself to prove to Siegfried on the rounds he is a very capable vet and he is proud of himself that he got the job. All of those are sweet moments because it shows he cares and had worked really hard to get where he eventually ended up and would stay for his entire career. With the job situation for Vets being so poor in the 1930’s, I would assume he was extremely worried about what he was going to do for the future. The bus scene at the beginning of the episode is one of my favourites. Throughout the entire series James had exhibited a youthful naivety about himself and it really is in full gear in this episode. He asks the guy next him a couple of questions and then the guy turns it around and asks James a question he can’t really answer all that well. 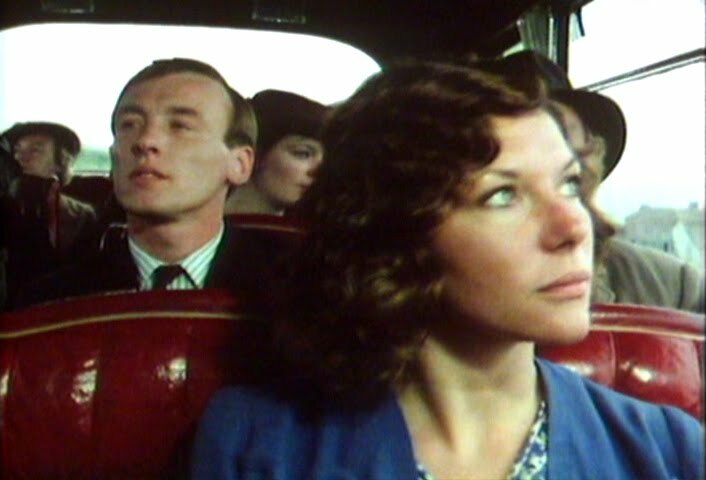 The first shot inside the bus is almost a two shot with James and another woman even though the woman is in the row in front of him. Afterwards after they get off the bus, James asks her for directions. The woman is Helen who would eventually become James wife. A really wonderful idea of having her just in the opening of the first episode. I didn’t notice that the first time I watched it. It is also possible I didn’t even see it until much later when I revisited the series. 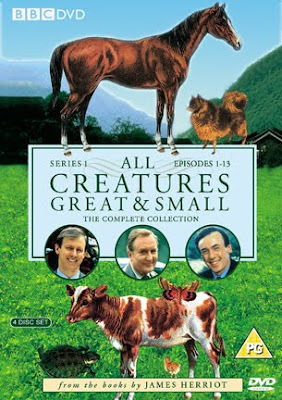 All Creatures Great and Small was an early PBS British television program for me. After I got into Doctor Who, I wanted to see more programs created by the BBC. I suddenly had an intense fascination with what the BBC was and the programming they put out. To be honest, this is a fascination I still have today. Though, back then I was hungry for anything I could get my hands on. Looking back, it’s not a bad fascination to have when you are eight years old. While other kids were into the coolest trends, I was tracking down what other output I could watch from the BBC. It’s funny to think, I really haven’t changed between then and now. What was a plus for me to watch All Creatures Great and Small was that when I noticed it on KTCA one Sunday afternoon, I recognized Peter Davison in it. Of course, because he was in it, I had to watch it. As time went on, I stopped watching it. A big part of it was that it was no longer being shown on KTCA and I never taped any of the episodes. Cue my article from May as I wrote about seeing A&E was running “new” episodes. Of course these are also good but it really lacked what I remembered as this amazing programs. Could it be that the memory cheats? Flash forward to the early 1990’s and I had a friend in financial difficulty. To give her some money, I bought all of her movie version VHS tapes of Doctor Who (as one does) and also about 4 tapes of All Creatures Great and Small tapes on LP speed. I think it was between 12 and 16 episodes on the tapes. I stuck in the first tape and a flood of memories returned to me. I don’t really mean about the plot, although some of it was familiar, I meant more about the style and energy of the series I remember loving as a child. The opening theme music, aka Piano Parchment by Johnny Pearson, had a lot more oomph in the original episodes than it did in the A&E episodes. In the early episodes, the theme music is over-modulated and almost distorts but it is a beautiful piece of music. This great music is set to visuals of a car driving down country roads, going through puddles on a sunny day. The show was recorded in the 1970’s and looked it which only benefitted my viewing experience. I love the BBC practice at the time of recording all interior shots in studio on videotape and shooting all the exteriors on film. I can appreciate why this may be jarring to some and possibly why a director may be pulling their hair out, but I love the look to it. I had never seen anything like it before. Plus, years later when I actually thought about it, it made me think that small jarring visuals like that only told me the story was good enough to overcome small visual obstacles like that. Seeing this series, especially series 1-3, was great too because it opened up the world to me; it was so different than the Minnesota suburb I lived in. All Creatures Great and Small showed me beautiful English country sides that I have loved forever since. 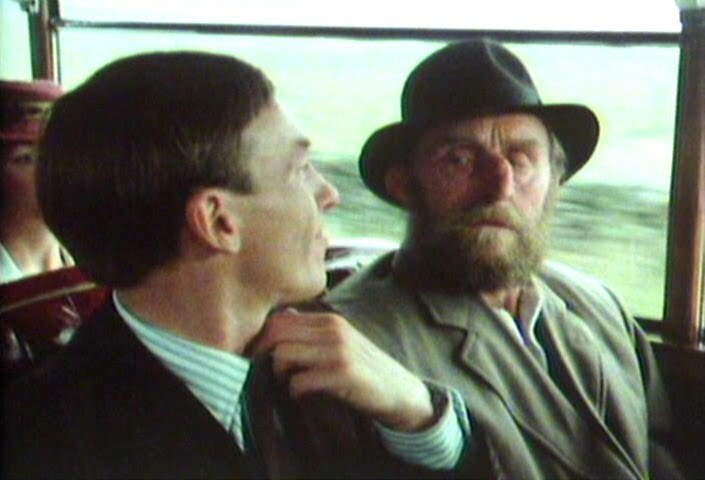 One other thing I always wanted to give credit to the BBC for was the opening scene in the bus. James is sitting next to a disfigured person who is playing the part of the passenger. As he should be, he is integrated into the scene as a person sitting next to James. There are no mentions of his disfiguration; he is equal. I think that is great. The reason I mention in is because I am struggling to think when I ever saw a US program where someone with a disfigurement is in a scene and there is no mention what so ever about it. They are part of the scene and it is done. This is not a “special episode” of All Creatures Great and Small where James sits next to someone different on a bus. My point is that the series, the director, and the BBC looked passed it and hired this person for a part that needed to be filled. I do remember where there are actors hired in roles where they are in wheelchairs. Maybe I am jaded but when people with disabilities are casted in roles now, it almost seems it’s more to check something off a checklist than to hire the best person for the role regardless of how “perfect” they are. Next week: We continue to watch the first episode of a series as well as continuing to watch series which start with the word “All”. 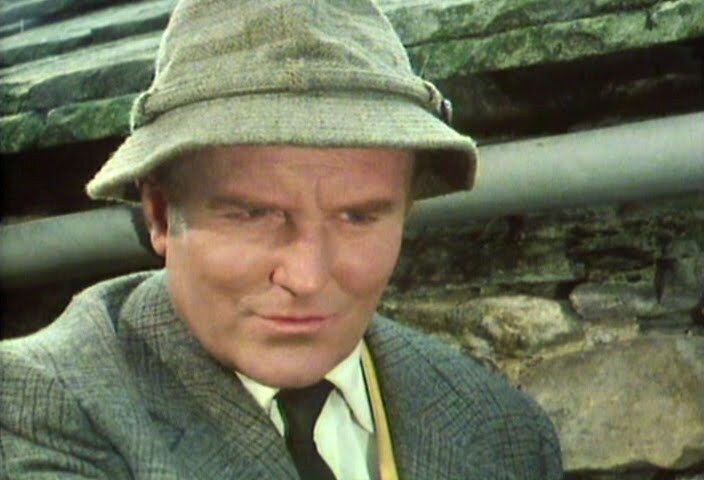 Next week I look at the first 2 episodes of All Gas & Gaiters: The Bishop Rides Again (Comedy Playhouse) and The Bishop Gets the Sack. i first watched the series in 1981/82 on PBS here in NYC..and was blown away by how great it was!..then 30 years later..present day..when i saw it was being shown again..i began watching it every wed night..once again completely hooked..THEN 2 weeks ago in the episode where sigfried and james go off to join up in 1940..i realized that THAT episode must be the end of the series..i was CRESTFALLEN!..so when i checked my tv schedule and saw that there was another episode coming the following wed..needless to say i was THRILLED..but when i watched it this past wed..i was confused and horrified!..it was commpletely different..with someone else playing helen..and the other characters hardly seemed like the same people!..then i found out that THAT was from 1988..not the original series..i can't tell you what a bad taste that left in my mouth!..in my opinion they RUINED it! !..they should have left well enough alone and let it go down in 'tv history' with the dignity and excellence it exhibited in the first go-round..sorry but i just had to vent!.. I know what you mean. I have grown to enjoy the later series and I ask that you stick with it but to be honest the later series is nowhere near as good as the earlier series. 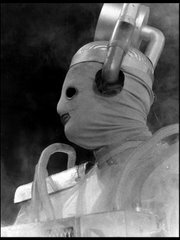 It gets better when Tristan returns full time in Series 7 but there is something unique, innocent, mischievous and overall fun about the original run. I have been watching the series on Netflix. Although we do miss out on 2 ACG&S Specials that show the return of James and Sigfried back from the war. I do agree with Barb that the change in actresses leaves a lot to be desired. There is just no replacing Helen in my mind. I have recently read that Carol Drinkwater and Christopher Timothy were in a lengthy off camera relationship that soured and she chose not to continue in the role. I blame the casting director for a poor choice of actress in the re-casting. I am only up to season 5, disappointed as I am, thanks to you Greg, I really look forward to the excitement of the rest of the series. Lucky me. My latest random pick to watch is ACGS, and I just finished watching the first episode. Truly magnificent television, and no matter how many times I have seen it, it still seems fresh and new as though I am seeing it for the very first time.